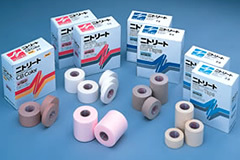 Athletic taping has been shown to be highly effective in injury prevention, first aid, and injury recurrence prevention. Today, it has come into widespread use among world athletes as well as ordinary people who enjoy sports as a hobby. The parts of a body that tend to require taping are wrists, elbows, shoulders, ankles and knees and are often engage rigorous motion. Above all, the skin constantly breathes and perspires, protecting body. The tape to wrap around the affected areas needs not only to have excellent adhesive properties, but also to demonstrate elasticity, air permeability and ease of use e.g. 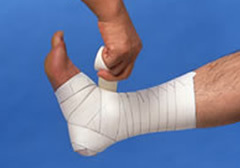 to wrap the affected area effectively. NITREAT facilitates and exceeds the requirements due to the macromolecular synthesis technologies together with the treatment of the excellent skills of professionals.